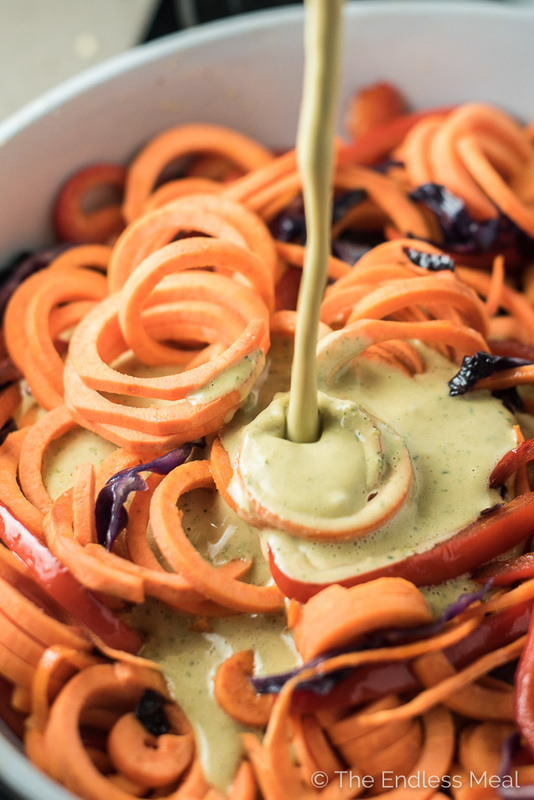 This delicious Sweet Potato Noodle Stir Fry is made with spiralized sweet potatoes smothered in a creamy Thai-style peanut lime sauce. 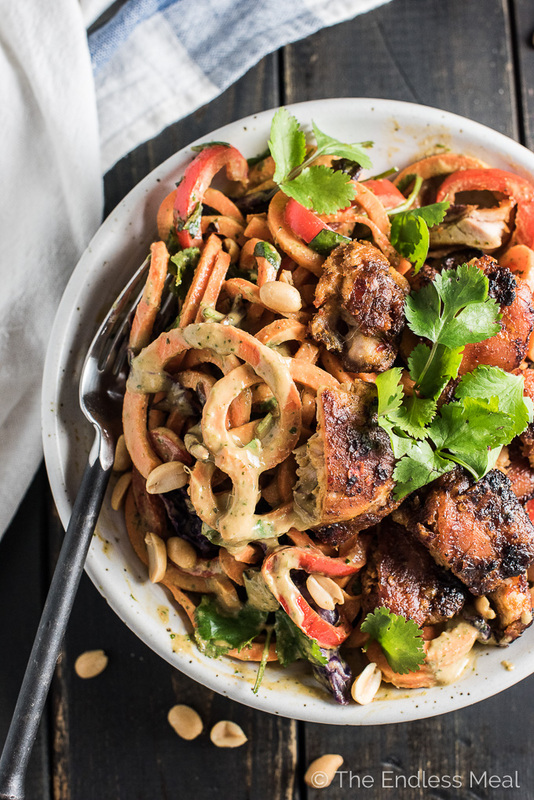 Top it with some Thai marinated chicken or go vegan and top it with some crispy tofu. Either way, it is a healthy and totally addictive dinner recipe that is super easy to make. It's Friday! The weekend! Hooray! ??? Are you as in need of some serious weekend chill time as I am? This week my little girl suddenly decided she's not so little anymore (8 1/2 months is super old). Crawling is still around the corner, but wiggling, rolling and getting into EVERYTHING is totally her thing now, and she's damn good at it. I sat her on the floor in front of the pantry the other day while I was shooting a video. No prob, right? Ha! When I looked over she had the immersion blender, the blow torch, and the mandolin all sitting in front of her. Total parenting win. ? I thought that this weekend we all deserve a giant bowl of feel good noodles. 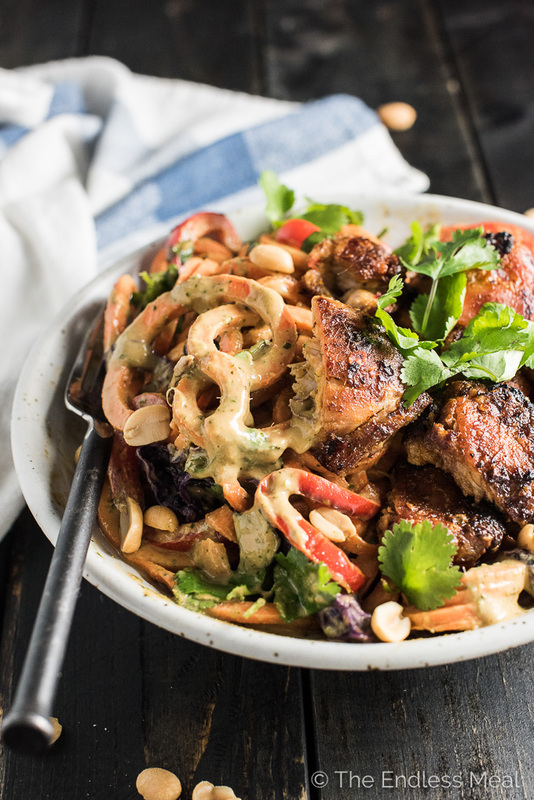 Only by noodles I mean this sweet potato noodle stir fry that's smothered in the tastiest peanut lime sauce. Not going to lie, it's amazeballs. 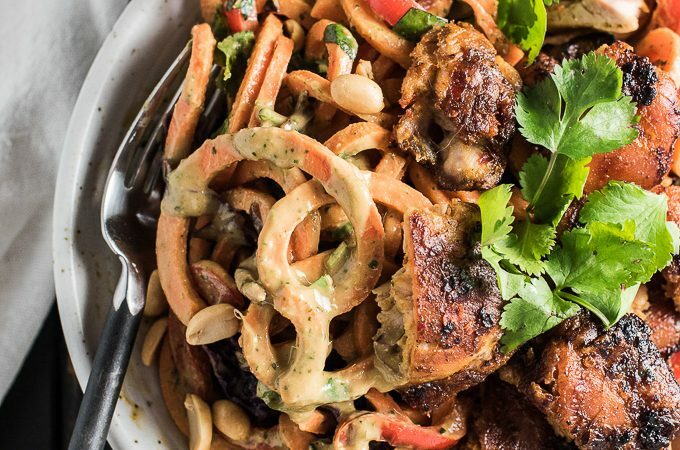 The sweet potato noodles and the Thai-inspired sauce are made for each other. The stir fry is dotted with some red peppers, purple cabbage, and green (as it always is) cilantro. It's pretty, colorful, and delicious. It's also a super adaptable recipe that can be made to suit almost any diet. Paleo? No problem, I've got an easy sub for you. Vegan? Awesome, top this stir fry with some crispy tofu. Gluten-free? Use some gf soy sauce and you're good to go! ♡ Are you vegan? Use the tofu option and either skip the fish sauce or replace it with a little Marmite. So easy! ♡ Do you follow a paleo diet? Peanuts aren't paleo, but almonds are. Use almond butter instead of peanut butter and swap some cocoa aminos for the soy you can dive right in! ♡ Do you have to steer clear of gluten? No prob at all! Just make sure you're using a gluten-free soy sauce like Tamari and you'll be good to go. 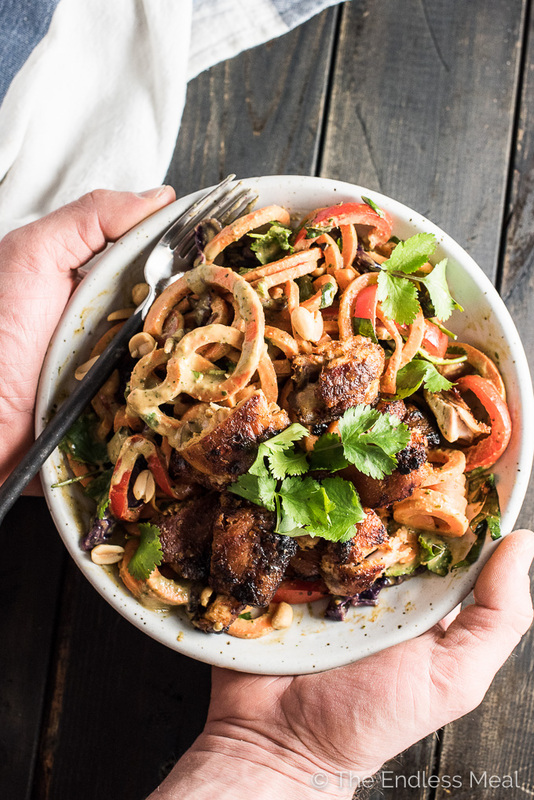 If you make this Sweet Potato Noodle Stir Fry with Thai Peanut Lime Sauce make sure you snap a pic and tag #theendlessmeal on Instagram so I can like and comment on your photos. I love seeing TEM recipes you create! Place the marinade ingredients into a large resealable plastic bag and squish the bag to mix them together. Place the chicken or tofu into the marinade and gently shake the bag so that everything is covered. Place the bag in your fridge and let it marinate for 30 minutes or up to 8 hours. Set your oven to 400 degrees. Place the chicken or tofu and all the marinade in a baking dish and pop it into your oven. (No need to wait for your oven to completely preheat.) Cook for 20-25 minutes, with the option to broil for the last 5 minutes to help brown the chicken or tofu. While the chicken or tofu is cooking, prepare the rest of the meal. Add all the sauce ingredients in your blender and blend on high until smooth. For a less smooth sauce, you can mince the garlic, ginger, and cilantro and whisk all the ingredients in a bowl. The sauce will be runny. Heat the oil in a large skillet over medium-high heat. Add the bell pepper and cabbage and stir-fry for about 3 minutes, or until they just begin to soften. Add the sweet potato noodles to the skillet and stir-fry, carefully turning them as they cook, for about 5 minutes. You want the noodles to have a slight crunch to them, but not so much that you feel you're eating raw potatoes. Pour the sauce into the pan and sprinkle the cilantro and Thai basil over the top. Toss gently. The sauce will quickly thicken in the heat. This meal was so delicious! I used smoked tofu because that was the only kind available. Next time I’ll serve it in a bed of lightly steamed kale. Definitely a keeper! Loving this! I’m always up for a bowl, and this is such a healthy treat. It’s so nice when dinner can be tasty and healthy, isn’t it? !